The Mexican-German Climate Change Alliance and the Vertically Integrated Climate Policies (VICLIM) global project – both implemented by the Deutsche Gesellschaft für Internationale Zusammenarbeit (GIZ) GmbH – contribute to the development and implementation of climate policy at the subnational level and its alignment with the commitments of Mexico’s Nationally Determined Contribution (NDC), helping to identify the relationship between the NDC and key sectors such as energy and tourism and how this plays out at the local and/or regional level. The Ministry of the Environment and Natural Resources’ (SEMARNAT) mandate is to shape national climate change policy, aligning it with the policies and activities developed at the subnational levels to ensure congruence and promote the goals established at the federal level. Through the National System on Climate Change (SINACC), Articles 8 and 9 of the General Law on Climate Change (LGCC) call for the country’s states and municipalities to join the national climate change effort. 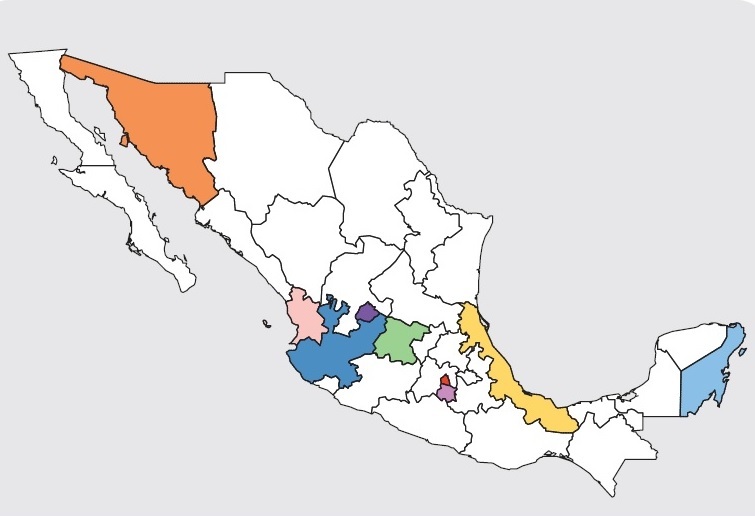 On this front, GIZ has supported SEMARNAT’s General Directorate of Climate Change Policies (DGPCC) to strengthen the role of states, and recently of municipalities, in the fulfillment of Mexico’s climate objectives under the NDC. This collaboration has focused on capacity development and the exchange of experiences about climate change mitigation and adaptation, the generation of robust planning instruments for climate policies and monitoring systems, climate financing and the creation of financial instruments. Additionally, GIZ has facilitated intersectoral dialogue at the local-regional level to implement pilot actions shared by all local sectors (public, private and civil). Learning about the current state of the legal and institutional framework, as well as about the instruments for managing climate change at the state level and their alignment with the NDC. Promoting the development of national experts, including 400 public officials, responsible for implementing and developing climate policies in 31 Mexican states. Encouragement for updating state climate change laws aligned with federal regulations and international climate commitments, by way of advisory services to the states of Sonora and Morelos; and the development of general guidelines that serve as precedents for other states. Greater transparency about the progress of subnational climate policies through the development and implementation of monitoring systems for state climate change plans, such as those of Veracruz and Jalisco; increased transparency about the generation of gender indicators; and about fulfilling the local reporting requirements for the National Emissions Registry in Mexico City and specific measures such as solar heaters in Aguascalientes and rainwater collection systems in Guanajuato, which will amount to a reported reduction of more than 2.8 million tCO2eq. Guidance for states and municipalities in accessing, obtaining and generating climate funds and financial vehicles. The goal is to implement adaptation and mitigation measures through practical guides, and to design operating rules and processes for calls for proposals for the environmental funds of Jalisco and Sonora states. Through these efforts, more than 300 million pesos will be mobilized for environmental purposes. Generation of dialogue that has allowed for the exchange of experiences between municipalities of Jalisco state and the National Climate Initiative (NKI) of Germany to adopt financing schemes for climate change mitigation measures. Creation of the first guide supporting the development of municipal climate action plans aligned with state climate change policies and the NDC. Development of two webinars and two videos as communication tools that encourage the exchange of knowledge and experiences in Mexico at the national, regional and international levels, and that promote climate action with a focus on sustainable local development. Strengthening of the climate change capacities and the mainstreaming of biodiversity in agro-food production in SAGARPA offices, and of extension agents and producers at the local level in the following states: Jalisco, Michoacán, Yucatán, Coahuila and Puebla. Continue collaborating on the development of instruments that facilitate the implementation of measures, scaling and vertical integration, monitoring and alignment with national contributions. Encourage the use of eco-technologies that reduce the vulnerability of public buildings and houses in all states. Identify areas of convergence between climate change and energy policies, and their instruments at the local level, so that opportunities to leverage their co-benefits and strengthen their alignment can be identified.